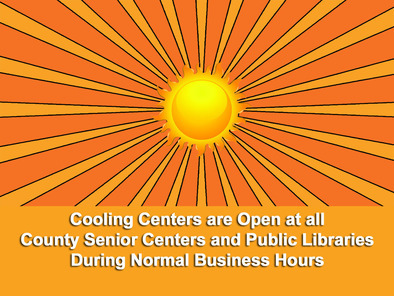 Cooling centers are open during regular business hours at County Senior Centers and the Department of Citizen Services. All branches of the Carroll County Public Library System will also be open as cooling centers during regular business hours, Monday – Thursday 9:00 AM – 8:45 PM; Friday and Saturday 9:00 AM – 5:00 PM. Both the Eldersburg and Westminster branches are also open on Sunday from 1:00-5:00 PM. • Slow down. Strenuous activities should be reduced or rescheduled for the coolest times of day. • Wear loose, lightweight, and light colored clothing. • Eat less protein and more fruits and vegetables, and drink plenty of water. • Stay in air-conditioned buildings or rooms, and limit time outside if possible. Additional places you can go to cool down include stores, malls, restaurants, churches, movie theaters, and homes of friends and family. • Check up on neighbors who may be more vulnerable to hot weather. • NEVER leave a child, pet, or elderly person alone in a car, even for a minute. This can quickly cause heatstroke and even death. If you see a child, elderly person, or pet alone in a car, call 911. For additional information, visit the Carroll County Health Department website. On Our Own (410-751-6600) provides a community center at 265 East Main Street, Westminster. Hours vary and are available at http://www.onourownofcarrollcounty.org/. Stores, malls, restaurants, churches, or the homes of friends and family. Information about cooling centers elsewhere in Maryland is available from the MD Office of Preparedness & Response. Access to air conditioning and water will be available at all of the cooling centers. Update your subscriptions, modify your password or e-mail address, or stop subscriptions at any time on the User Profile Page. You will need to use your e-mail address to log in. If you have any questions or problems with the subscription service, e-mail subscriberhelp.govdelivery.com for assistance. All other inquiries can be directed to webmaster@ccg.carr.org. This service is provided to you at no charge by Carroll County Government. Visit us on the web at http://ccgovernment.carr.org.